If you have an active call, click the Add People icon. 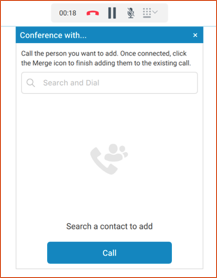 This will add a tab with a search box to add another user to your call. Enter part of a name or number and choose the user, or enter the full number or extension and click Call. This places the current user on hold and places the call to the new contact. The toolbar then changes to reflect that you have two calls with your first call noted as On Hold. When you are ready to join everyone together, click the green Merge Call button. You are now joined in a 3-way call and everyone can speak to each other. The Toolbar changes to reflect that you have a Group call and that you are the owner.